What is the Best Dog Food for Gas? How To Find Dog Food That Prevents Gas? What Food Cause Gas In Dog? What To Look For In Food That Prevents Gas? We know that you love your dog, but the same can’t be said for his repellent winds that can clear the room in an instant. Unfortunately, farting is unavoidable and you can’t stop your pooch’s winds, however, you can minimize them. The type of food your dog eats can be the reason behind his stinky farts and in this case, the best dog food to prevent gas can help. However, some disease can cause a dog to have stinky winds so you should have your dog examined by a vet. We will list and review 5 dog foods that will make your pup’s stinky farts the thing of the past. Canidae is a well-known dog food brand, and their limited ingredient line is specially designed for dogs with sensitivities. 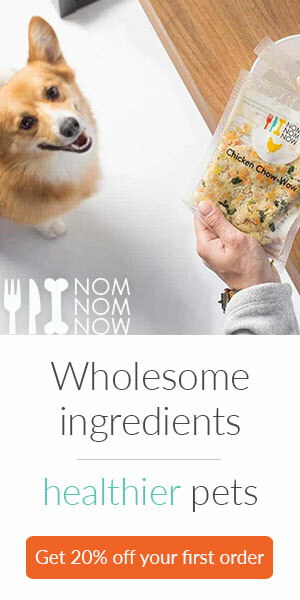 Featuring only premium quality and easily digestible ingredients this food is suitable for dogs that fart a lot. The main ingredient, Salmon is followed by Salmon Meal and Menhaden Fish Meal. Combined they create 32% crude protein for healthy and toned muscles. Sweet potatoes and Peas are easily digestible carbs that won’t cause flatulence and gases. They create 4% crude fiber and give your dog energy to stay active throughout the day. Canola oil is the main source of fat and supports healthy skin and coat. With 18% crude fat this food is a great choice for active dogs that have digestive issues. This food is supplemented with all necessary vitamins and minerals for a strong immune system. Added probiotics help with good gut bacteria and ensure easier digestion. Best Dog Food For Dogs With Gas – This formula doesn’t contain any chicken by-products, preservatives, or additives which makes it a suitable food for gassy dogs. NUTRO MAX is made in the USA with natural and non-GMO ingredients and meets the nutritional needs of adult dogs. The main ingredient is Chicken meal which is easy to digest and won’t cause flatulence. This dog food for dogs with gas contains 22% crude protein which is the perfect amount for gassy dogs. Dried Potatoes are easily digestible carbs that stop dog farts. 3.5% crude fiber will not stuff your dog’s stomach and will help him absorb nutrients without creating intestinal gas. Chicken fat is the main energy source and it at the same time supports healthy skin and coat. This food contains 14% crude fat that will keep your dog energized and active. Vitamin and minerals are added to this food to make it complete and balanced and suitable for daily feeding. This dog food for gassy dogs contains Dry Beet Pulp to support healthy digestion and normal stools. Best Dog Food For Gassy Dogs – If you often ask yourself why my dog farts, try to find out if he is experiencing any more symptoms of allergies and a sensitive stomach. Taste Of The Wild makes grain-free and novel protein dog foods that are suitable for dogs with gas. Food That Prevents Gas – Hill’s Science specializes in creating dog food for different ailments in order to help owners and their dogs. Hence, they created a special formula for dogs who have digestive problems and smelly farts. The main source of protein, Chicken Meal contains higher protein count and is a suitable protein for dogs. It creates 23.6% crude protein which is a good amount for adult dogs. The main ingredient in this food is Brewers Rice. Whole Grain Sorghum and Cracked Pearled Barley are other grains that create 1.6% crude fiber. Pork fat and Soybean oil are main sources of fat that also support healthy skin and shiny coat. Together they create 15.2% crude fat which the main source of energy and will keep your dog active. Lack of artificial colors, flavors, and preservatives combined with easily digestible ingredients support your dog’s gastrointestinal system. Thus, minimizing flatulence and diarrhea. This is a limited ingredient formula made with only one protein source to support healthy digestion. Multiple protein sources are one of the reasons why do dog farts smell so bad, and this food should fix that problem. Deboned Turkey is the main ingredient and easily digestible lean meat that creates 20% crude proteins. This dog food for gassy dogs will at the same time resolve stinky winds and support muscle and tissue development. This is a grain-free food that contains Potatoes and Peas that will fill your dog’s belly without causing gases. With 6% crude fiber you will notice an improvement in your dog’s bowel movements and stinky dog farts will stop. Canola oil is the main source of fat and also supports healthy skin and coat. It creates 12% of crude fat and is the source of omega 6 fatty acids. This food contains all the necessary vitamins and is made without artificial flavors, preservatives, wheat, corn, or soy. Pumpkin and Chicory Root are added to support better digestion and nutrient absorption. Dog Food That Doesn’t Cause Gas – Wellness made this formula simple, but still full of natural and high-quality ingredients for dogs with food sensitivities. A limited number of ingredients in this food can help if your dog farts all the time, and soothe his stomach. The main ingredient Salmon creates 29% of crude protein and since it is a novel meat it can be an answer on how to stop dog farts. This amount of proteins will support muscle and tissue growth and keep your dog active. Peas and Potatoes are easily digestible carb sources in this grain-free dog food. Combined they create 5% crude fiber which is a good amount if your dog’s farts smell really bad. Canola Oil and Ground Flaxseed are sources of energy and fat that support healthy skin and coat. With 14% crude fat your dog will be energized and ready for his daily activities. Wellness supplemented this food with all necessary vitamins and minerals to make it suitable for daily use. To promote better digestive health, Wellness included Chicory root as a natural probiotic. Anti Gas For Dogs – The answer to why my dog’s farts stink so bad is in most cases poor nutrition and lots of table scraps. Holistic Select uses only premium quality ingredients that support digestive health and provide balanced nutrition. The main ingredient is Lamb Meal which creates 23% crude protein and is at the same time single protein source. Often stinky dog farts occur in dogs that eat various meat sources at the same time, so try switching your dog’s food if this is the case. Oatmeal, Peas, and Rice are carb sources that create 4.5% crude fiber and are responsible for keeping your dog’s stomach fuller longer. However, if your dog has grain allergies this food won’t be suitable for him. Chicken fat is the main source, of fat and it supports healthy skin and coat. As the main energy source it creates 15% crude fat which is a good amount for active dogs. Fresh fruits and vegetables are reinforced with supplements, digestive enzymes, live yogurt cultures, prebiotics, and probiotics. Good Food For Flatulence – Purina Pro Plan created this formula keeping in mind dogs with sensitive skin & stomach. Made from high-quality ingredients this food doesn’t contain artificial colors, preservatives, corn, wheat, or soy. Barley, Ground Rice, and Oatmeal are wholesome easily digestible carbohydrates. Combined they create 4% crude fiber, and rice is known for its soothing qualities and ability to improve bowel movements. Sunflower oil supports healthy skin and coat and creates 16% crude fat. Added prebiotic fiber supports a healthy digestive system and prevents frequent gases. Purina Pro Plan also included all the necessary vitamins, minerals, and antioxidants to support your dog’s overall well-being. Omega 3 & 6 fatty acids are included to improve skin and coat quality. Best Food To Stop Dog Farts – Natural Balance uses only a few high-quality ingredients to help dogs that suffer from allergies, digestive problems, and gases. This grain-free formula doesn’t contain any artificial flavors, colors, or preservatives. Salmon is the main protein source in this formula and is followed by Menhaden Fish Meal. Combined they ensure a fishy flavor and a protein count of 21% for toned and lean muscles. The main ingredient, Sweet Potato is a premium quality carbohydrate and highly digestible energy source that creates 4% crude fiber. Since this is a limited ingredient formula a carb as the main ingredient can be tolerated. Otherwise, you should stick with foods that have named protein as the main ingredient. Salmon Oil is used as the main fat source and creates a minimum of 10% crude fat. Besides being the main energy provider, Salmon oil also supports healthy skin and coat. Since this is a limited ingredient formula fresh fruits and vegetables aren’t included, but all essential vitamins and minerals are supplemented. Omega 3 & 6 fatty acids are included to support a shiny coat and healthy skin. A limited number of ingredients. Potatoes are the main ingredient. Best Food To Reduce Gas In Dogs – The Rachael Ray Nutrish Zero Grain Dry Dog food is made from high-quality natural ingredients and doesn’t contain artificial colors, flavors, or preservatives. Furthermore, there are no fillers or poultry by-products which ensures easy digestion. The main ingredient is farm raised Chicken followed by Chicken Meal. Combined they create 26% crude proteins which support lean and strong muscles. Sweet Potatoes and Dried Peas are highly digestible fiber sources that create 4% crude fiber. Tapioca is also included as an easily digestible gluten-free carbohydrate. Whole Flaxseed and Chicken Fat are main sources of energy and create 14% crude fat. Flaxseed is a natural source of Omega 3 & 6 fatty acids and supports healthy skin and coat. Dried Beet Pulp is a natural source of prebiotics which help with digestion and reduces gas in dogs. This food also contains all the necessary vitamins and minerals that support a strong immune system. All dogs experience gases from time to time, but if you notice a sudden change in the frequency and smell you should make some dietary changes. On the other hand, repellent winds can be a sign of an underlying issue so you should have your dog examined by a vet. You will never be completely able to stop your dog from farting, it is, after all, a completely normal thing. Owners often ask themselves why is my dog farting so we will list the most common reasons. Swallowing air: You may be wondering how swallowing air is related to why my dog fart, but when a dog swallows it, it creates small air-filled pockets. These pockets can be released as burps or farts. Diseases: Health conditions like Inflammatory Bowel Disease, Irritable Bowl Syndrome, pancreatic disease or tumors can be the reasons why my dog’s farts stink. If your dog has really smelly winds all the time you should take him to a vet. Allergies and sensitivities: Some dogs are allergic to common protein sources like chicken or beef or grains. If you ask yourself why does my dog keeps farting, look for other symptoms of allergies and change his food. Poor quality food: Low-quality foods are full of additives, preservatives, and low-quality ingredients that are hard to digest. In this case, don’t wonder why does my dog fart a lot, instead change his food for a better quality one. Parasites: Intestinal parasites, roundworms, in particular, can cause excessive gas as a symptom. So if you skipped your regular deworming treatment don’t wonder why my dog farts a lot, instead give him the proper treatment. Bacterial imbalance: There is no doubt that dogs thrive eating meat, but too much can cause the imbalance in gut bacteria. In this case, supplement your dog’s diet with prebiotics that contains good gut bacteria. Some foods are harder to digest and they remain longer in the intestines fermenting which ultimately cause a dog to produce toxic fumes. Luckily, there are foods that don’t cause flatulence and support healthy digestion and bowel movement. If your dog has started producing toxic fumes of late try switching him to a dog food that contains some or all of the following things. High-quality protein: Beef and chicken are the most common causes of allergies in dogs, and if your dog is having stinky farts look for different sources of protein. Salmon, duck, and lamb are high-quality choices and look for a protein count around 25% on dry matter basis. Low fiber: Foods that have higher fiber count usually contain grains and some carbs that cause flatulence and gases. Look for easily digestible carbs like sweet potatoes and foods that have around 3% fiber count. Prebiotics: Many high-quality dog food brands include prebiotics and probiotics in their formulas to support digestive health. Prebiotics will stabilize the gut bacteria and significantly decrease stinky farts. Simplicity: Limited ingredients dog foods have fewer highly digestible ingredient that can put your dog’s farting to a minimum. Try to find the food that incorporates some of the things mentioned above and give it a go. All dogs fart, and there isn’t anything we can do besides accepting it just as one more of those things we need to live with. Still, it is normal for a dog to fart once in a while, but if your pooch drops toxic bombs every single day you need to do something. In most cases, a switch to the best dog food to prevent gas will do the trick. Look for foods that are easy to digest, have novel protein, low fiber count, added prebiotics and probiotics. If you don’t notice any changes in the frequency of gases in the next 2 weeks, schedule an appointment with your vet and have your dog examined.